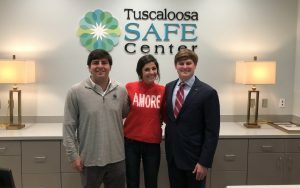 UA IFC President Vincent Zicarelli, UA Panhellenic Association President Lexi Matallana and UA SGA President Price McGiffert at the Tuscaloosa SAFE Center. 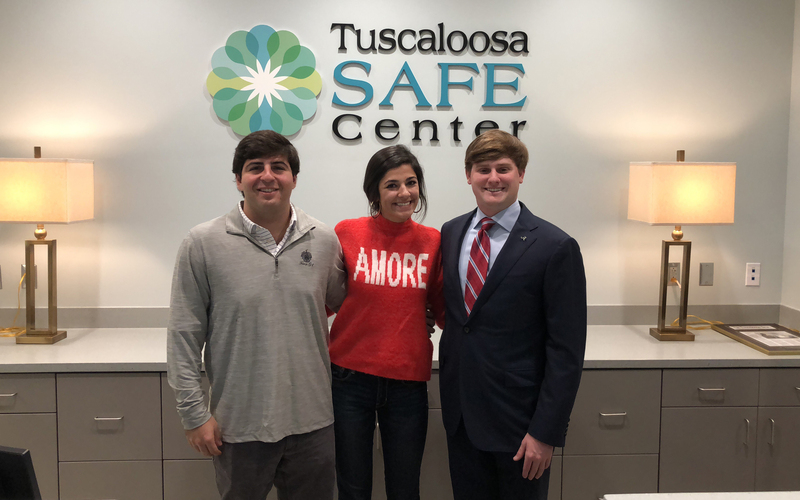 TUSCALOOSA, Ala. — The University of Alabama’s Interfraternity Council and Panhellenic Association each recently donated $25,000 to the Tuscaloosa SAFE Center and UA’s R.E.S.P.E.C.T. Fund. The Tuscaloosa SAFE Center is a community-based, collaborative agency designed to meet the emotional, medical and forensic needs of sexual assault survivors. The center, which opened last month, serves Tuscaloosa, Bibb, Fayette, Greene, Hale, Lamar, Marengo, Pickens and Sumter Counties. Price McGiffert, UA Student Government Association president, serves on the center’s board of directors. Created last year by UA’s SGA, R.E.S.P.E.C.T., which stands for Reaching Every Student Possible Ensuring Care and Treatment, is an endowment to increase mental health awareness and resources on campus. Over time, the UA Counseling Center and other agencies will be able to use the fund where deemed necessary to promote student health and well-being. The R.E.S.P.E.C.T. Fund has raised more than $100,000 over the past year. The goal is for the fund to raise $1 million over 10 years.